She has been called a hobbit, a deformed human, and even an “alien from Earth.” Discovered in 2003 on the Indonesian island of Flores, her bones have sparked debates about who she is, how she came to be here, and what her relation is to us. 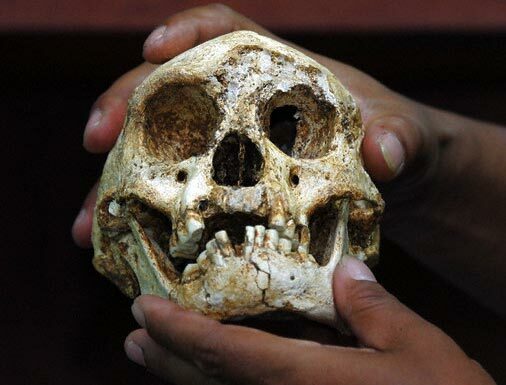 Her name is LB1, informally known as the hobbit, and she is the type specimen for a new species in our own genus: Homo floresiensis. 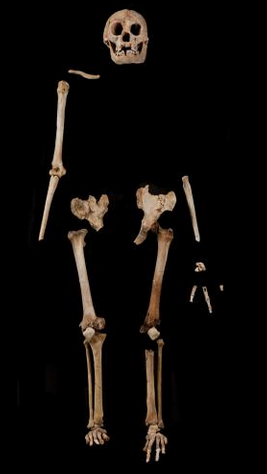 Consisting of a fairly complete skull and part of a skeleton, LB1 is arguably one of the most surprising discoveries in the history of paleoanthropology, and many of her mysteries are far from solved. She stood at only three feet tall, she existed on this planet relatively recently (70,000 years ago–a blink of an eye in the scope of human evolution), and she doesn’t look quite like any other hominin found to date. Here are a few facts I thought were interesting about the discovery and debates of LB1 (also known affectionately as Flo). Her discoverers were not looking for hominin fossils. When R.P. Soejono, Mike Morwood, and others organized excavations at the cave known as Liang Bua, they were actually looking for evidence of Homo sapiens’ migration into Australia. They were expecting to find stone tools, butchered animal bones, and maybe some modern humans–but definitely not new species of Homo. The discovery of a new species of hominin was a big surprise, to say the least! Flo is not alone. In total, the team has found partial remains of nine individuals at Liang Bua. LB1, however, is the only skull. Skulls are extremely informative, every detail from teeth to brain size and shape provide crucial details for paleoanthropologists about who these creatures were. It’s worth mentioning that Flo is also found in the company of stone tools, komodo dragons, many other fossil creatures such as pygmy elephants known as Stegadon. Significant controversies have shaped her study. LB1’s discovery and scientific study has raised all sorts of questions over the past decade. One of the more major ones was the controversy that ensued when the bones were borrowed by a paleoanthropologist who allegedly damaged LB1 trying to make cast replicas. This event is discussed a bit here, but there is certainly a great deal more to the story. Her DNA eludes us. Though scientists have managed to recover DNA from fossils much older than the hobbit (like Neandertals), they have had extreme difficulty extracting DNA from LB1. The environment of the cave is not conducive to preserving DNA well. In fact, the bones of LB1 have been described as intitally having the consistency of “wet blotting paper”–a fact that also makes it difficult for DNA to be well preserved within the bones. There is so much more to the hobbit’s story, some of which I am exploring in my dissertation research. Stay tuned for more info about a very small relative! Morwood, Mike J., and Penny Van Oosterzee, A New Human: The Startling Discovery and Strange Story of the” hobbits” of Flores, Indonesia, (New York: Smithsonian Books/Collins, 2007). Falk, Dean. The fossil chronicles: How two controversial discoveries changed our view of human evolution. Univ of California Press, 2011. Stringer, Chris, “Human Evolution: Small Remains still Pose Big problems,” Nature 514 (2014): 427. Good luck with the dissertation! Picking an interesting subject is (usually) a good idea. Staying tuned (or at least my feeds seems to be). Thank you! I’m excited to have a topic I find interesting. Haha great, thanks for staying tuned!